Wow, now that is dedication. Next we have to get you a trip to the ISS to test in near zero gravity. Wonder how far you would travel backwards in space from the recoil of a .460 Weatherby. Gee Mac...don't put ideas into his head mate...Slim is just as likely as not to do it...or go insane contemplating the answer. Take the velocity times the mass of the powder and projectile and devide that by your mass and that is how fast you will travel backwards (if fired from you center of mass). If you fire from the shoulder you are likely to do somersaults with twisting involved but very little directional movement. hmmm, maybe I could make a hand-held thruster pack that uses 22 LR. carry extra clips to recharge! You could get better speed with a seltzer bottle filled with mercury. Nasa uses water and air pressure for the manuvering thrusters on the EVA suits. I'm getting close to being able to conduct the temperature sensitivity testing. I've got the cold and hot of things figured out. 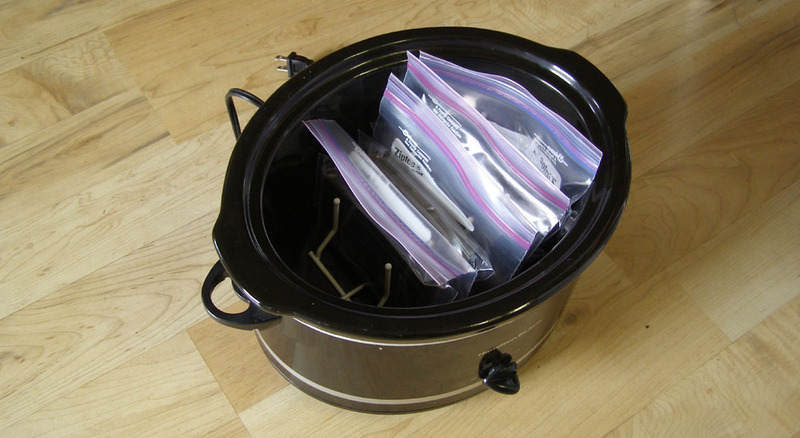 Crock-pot on warm with magazines sealed in freezer bags immersed in water. Cut-up an old dishwasher rack to hold them upright. I'm not worried about handing loose rounds with my hands because they basically are at the temperature I want to test at. Used closed sell foam cust to fit the top of the cooler. Slots cut out to hold magazines and temperature probes in .270 cases. Frozen meat below the foam which should keep the air colder than ice (may still use it anyway. Cut-outs will be used to seal the mag slots when removed. Wrapped insulation around metal mags and will use winter gloves to handle the cold rounds. Will have a large cooler with ice to cold soak the barrels with between firing sessions with cold cases. 4 shots in 10 seconds with .223 and 6.8mm. 2 shots in 10 seconds with .270 then back into the cooler. Rounds are all sequenced into the magazines. Next Friday is the target date! Your preparations look spot on to me. It will bee interesting to see the results. 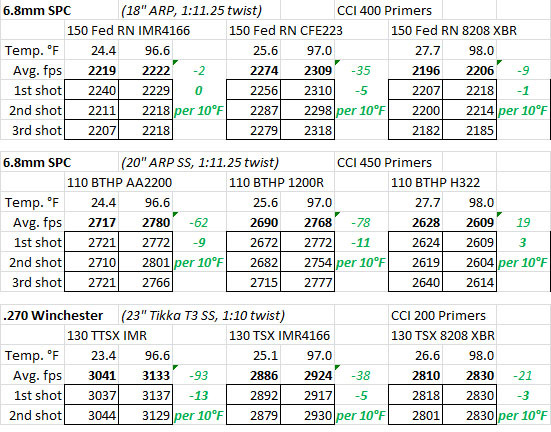 Well, the two powders I came to rely on last year, 1200R with 100gr bullets and CFE223 with 130gr bullets, were the worst performers in varying temperature conditions (summary of data in the table below). Seeing their velocities vary from range session to range session as summer changed to fall then to winter is what motivated me to conduct this test to begin with. In that sense, this temperature sensitivity testing validated what I was experiencing. Even though 1200R has shown good accuracy potential, I have become “gun shy” and will likely stop using it in the 6.8mm. Not only have I had a 250 fps spread in average velocity with 100 AccuBonds this past year, in hot weather, an individual bullet’s velocity can be unpredictable. 1200R did it during this testing with one of the rounds dropping 300 fps below the other. This is the 4th time I’ve recorded this happened in warm/hot conditions and I’m still on my first box of 100gr AccuBonds. I will continue to use CFE as its performance potential with 130gr bullets is so good. At least I understand CFE’s limitations when cold weather approaches. I may need to further investigate the CFE’s sensitivity to temperature with different primers. Even though 100 rounds were fired during this test session, there were so many different bullets and powders that the results should not be considered statistically significant. Consider these results as relative performance between powders, e.g., Re10x was less sensitive to temperature than Re7. Also, only two temperature test points were measured (e.g., 20F and 100F) and assumed a linear drop in velocity with decreasing temperature. This is likely with most powders but not all. Note, references listed earlier in this thread pointed out that a powder’s sensitivity to temperature is different for different calibers and for different weight bullets within a caliber which is also reflected in this data. Ambient temperature started at 52F and rose to 65F during the test session. I had plenty of back-ups - a digital and analog thermometer for both hot and cold conditions plus three chrono readings for each shot in case one of the instruments dropped a shot. The cold process for controlling the temperature of cartridges in the cooler using frozen meat (tubes of ground venison and sausage links) was very stable, starting at 16F warming to 20F during the test session. The testing started about an hour and a half after the cooler was packed. A Zero-Degree sleeping bag added extra insulation/insurance. The still frozen meat went straight back into the freeze upon returning home. The hot temperature process using the crockpot went from 105F down to 96F by the time hot testing was complete. I may have to increase the range for hot conditions. While unpacking at 75F ambient, the instrumented cartridge was left in the sun and stabilized at 105F. A hotter day would be even worse. During the cold testing, I tried cooling the barrels down with ice between test cycles - every four shots with the .223 and 6.8mm, every two shots with the .270 Win. Letting the barrels draw cool air from the bottom of the cooler with their actions open worked the best (see picture below, right side). All barrels were cold to the touch (approximately 45F) when starting any cold testing. Warm testing took less time and barrels cooled to be slightly warm to the touch by their next cycle. 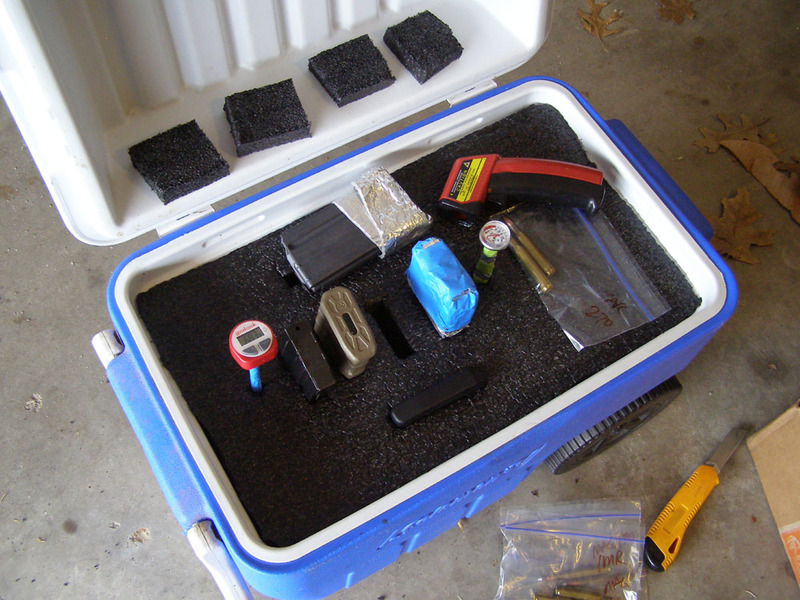 In prior testing, barrel temp was not found to be a primary factor with regard to a powder’s temperature sensitive for the limited numbers of rounds fired in a test cycle. This was verified during this testing as the 2nd rounds of each bullet/powder combination fired were even split in their bias, faster or slower. • CFE223 showed sensitivity to temperature across the calibers. BTW, it really does cut down on copper fouling, essentially eliminating it in my experience. • AA2200 was consistent across .223 and 6.8mm with lead-core bullets. TAC was the opposite. • IMR 8208 XBR, for being promoted as an extreme powder that is insensitive to temperature change, did not do as well as expected in any of the 3 cartridges. • Re7 was the most temperature sensitive of the typical 6.8mm powders tested. • I believe 1200R was actually worse than Re7 but cannot be compared because it dropped 300 fps when hot with one shot. This is the 4th time I've seen 1200R do this at the range. • The results with primers in the 6.8 were not what I’ve been taught, e.g., magnum primers do better in cold and provide more velocity than standard primers. ___ CCI 400 standard primers did not hurt 6.8mm in cold. ___ CCI 450 seemed to be more consistent in the warm conditions. ___ CCI 400 standard primers appeared to do as well or better than CCI 450 magnum primers in 6.8mm with respect to muzzle velocity. I’m just reporting test data here but know these primer results will cause debate. So, I went back and did some verification on primers and this was repeatable for the lot of CCI 400 and 450 primers that I have in my possession. Even though muzzle velocities were close, the groupings were noticeably different with the CCI 450s providing tighter groups in my rifle - well that would make sense as all the loads but the 150 RN were developed with CCI 450 primers. The Federal 150 Round Nose groups were the first time I shot these bullets. There was no load development, just picked a powder charge to see what both primers would do. I predict I will be doing more of this type of testing. I just can’t envision accumulating a large variety of powders like I have with bullets. Very interesting results. A hot primer may mean faster ignition but greater peak pressure with a faster burn. This may result in the same drop in velocity seen using a faster powder in a calibre and bullet weight than is usual. The combination is less efficient as it gives off more energy as heat and less to propel the bullet. Since single base powders are more temperature sensitive, the use of a hotter primer may bring a retarded powder back up to its normal burn rate. The thinking about using hotter primers in cold weather may not apply as well to double base powders. MacD, the magnum primer performed as expected in the .270 with IMR4350. This was not the case in the 6.8mm. Still pondering. Thanks for stoking the embers with fuel for thought. IMR4350 being a slow single base powder would benefit from a hotter primer in cold conditions if my postulation is correct. Did you use it in the 6.8 ? I reviewed the data you presented but didn't see it there. I picked up two more powders that are promoted as temperature insensitive: IMR 4166 and H322. IMR 4166 is new to the market, better suited to .223 and .308 applications but did testing with 150gr bullets in the 6.8mm (case full) and 130gr bullets in the .270 (well under case capacity) as a comparison. H322 has been around for a while and is applicable to the 6.8mm SPC. Cold rounds were fired before hot. No need to do any special environmental preparation for the hot powder testing. Temperatures reached 99F in the shade that afternoon. Summary of results and the details are below.